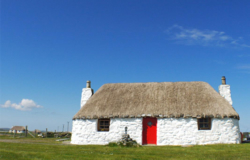 Tigh na Boireach is a traditional island blackhouse with a modern, cosy interior. Suitable for a couples retreat, the cottage features a double bedroom complete with four poster bed. The well equipped kitchen/living room contains everything you will need to enjoy your stay including a TV and DVD player as well as music station and wifi. The bathroom has an electric shower and bed linen and towels are included. The cottage is situated a short walk away from the stunning beach with its golden sand and turquoise sea. Guests have seen buzzards, owls and even a Golden Eagle from the garden which features a rowing boat filled with fresh herbs for guests to pick and enjoy. There are many walks that are suitable for all ages and abilities that offer a great way to engage with the unique landscape. The nature reserve at Balranald is easily reached with its rare birds including Corncrakes and Phalaropes. The dark skies are a haven for stargazers (particularly during the autumn and winter months) and keep an eye out for the Northern Lights too! For more information about the cottage and the island please visit www.tighnaboireach.co.uk.